From soup to nuts—literally! KP San Rafael’s cookbook is filled with employee and physician recipes that can help people stay healthy. You might say that Kaiser Permanente San Rafael’s Dionne Detraz, RD, and her colleagues in Employee Wellness had just the recipe for health. 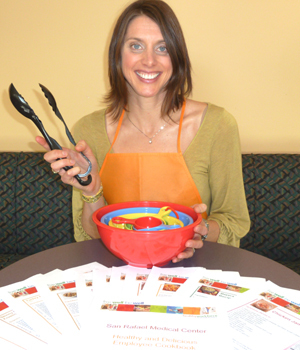 KP San Rafael’s Dionne Detraz, RD, and her colleagues went through every recipe submitted to ensure compliance with KP’s Healthy Picks Guidelines. KP San Rafael’s Dionne Detraz, RD, and her colleagues went through every recipe submitted to ensure compliance with KP’s Healthy Picks Guidelines. Last March, the San Rafael Live Well Be Well crew, including Laura Fraser and Moj Makki, launched a recipe contest to tie in with National Nutrition Month. San Rafael employees and physicians were invited to submit their healthy recipes to be considered for a special online cookbook. The theme for the book was simple: building a culture of health. 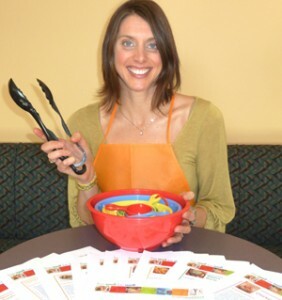 “We know we have a lot of good cooks in San Rafael who are practicing healthy lifestyles, so we wanted the recipes to come from them,” explained Detraz of her approach to publicizing the joys of healthy eating. In just a month, she and her colleagues received dozens of recipes that qualified (and a few that did not, because they didn’t meet the guidelines). Then began the hard work—or as hard as reading delicious ingredients and mouthwatering food combinations can be. After months of assessment, the 61-page “Healthy and Delicious Employee Cookbook” was recently posted online for all to enjoy—for free. We can all lift our glasses of gazpacho soup—page 43!—to that. To see the employee cookbook, click here.